The jail at the Sherbrooke Village Museum in Nova Scotia, was built back in 1862 and the barred windows ensured that prisoners would not escape. There were cells upstairs for the women and three cells downstairs which housed the men and every jail had barred windows on them. The jailer and his family lived in the jail house along with many of the legal offenders. This jail at the Sherbrooke Village Museum was used until the 1960's and now visitors can browse through the jail and stare out the barred windows. Barred windows of a Jail Cell in the Jailhouse in Sherbrooke Village Museum (a restored 1860's lumbering and shipbuilding community) in the town of Sherbrooke along the Marine Drive, Highway 7, Nova Scotia, Canada. 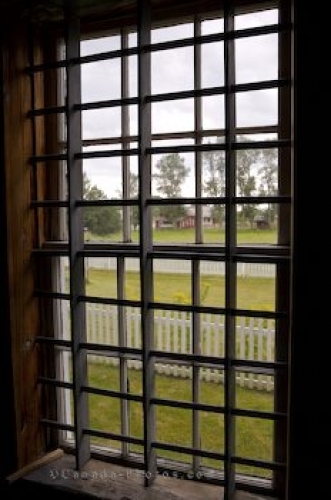 Picture of barred windows from inside the jail at the Sherbrooke Village Museum, Nova Scotia.